Starring Peter Lorre (Hans Beckert), Otto Wernicke (Inspector Karl Lohmann) and Gustaf Gründgens (Der Schränker /"The Safecracker"). While M often makes its way to the noir list of favorites among Internet reviewers, this film doesn’t quite fit the noir checklist. I consider it more of a police procedural, where M shines on many classical levels. 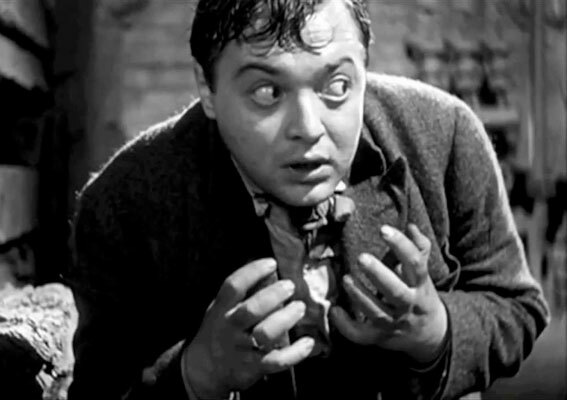 After 80 years, Peter Lorre is still riveting as the hunted child murderer, compelled to kill; lulling himself into a killing trance by whistling snatches from Peer Gynt. 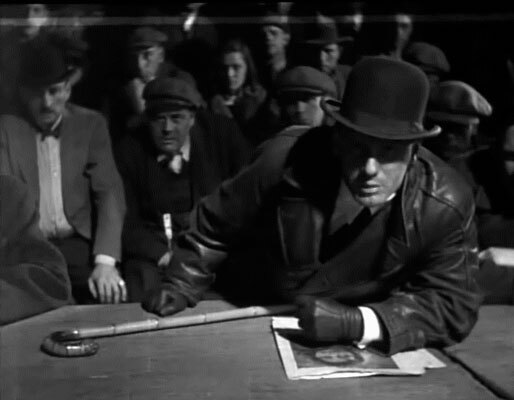 Director Fritz Lang builds apprehension and concern into M's opening scene. The slow, deliberate pacing of the characters' movements, from the children's game, to the exhausted mother struggling upstairs with her heavy load and finally to the careful tracking of little Elsie's last walk. The beautiful little movements of the mother as she prepares a meal for a child we know she'll never see again only increases our agony. There's the inevitable tension, slowly rising, as the little girl carelessly walks to the poster - and her fate. Lang carries the moment forward with the repetitive bouncing of the ball - indeed, the entire scene is filled with repetitive movements. As panic hits the city, Beckert ups the ante by taunting the police with notes, boasting of their futile efforts to capture him. Peter Lorre gives a multi-faceted performance of a sick creature who is just sane enough to carefully plan his crimes until his capture. The citizens demand further action, which prompts the police and civic leaders to meet and hash out a plan to catch the killer. Realizing that the increased manhunt is ultimately bad for business, the low lifes of the underworld are meeting to discuss the same thing. As the camera shifts from one smoky people-packed room to the other, the two groups reach the same conclusion, but from a different approach: The police will cull the lists of former mental patients, interview them and hopefully catch their man. The criminals will watch each and every child, following them until they find the culprit. As it happens, they both discover who the killer is, but the one who can actually identify him is a blind balloon seller, who remembers the tune that he whistled as he bought a balloon for the young victim. There ensues a wonderful scene where the petty criminals hunt Beckert down and put him on trial. The impassioned arguments for and against him reflect a double irony, since the grifters, beggars and prostitutes have experienced the same finger of guilt pointed at them. They've all pleaded for mercy as Beckert does, ranging from 'it's not fair' to their actions are 'beyond their control'. The intensity of the kangaroo court is unforgettable, as they are all ready to condemn him and execute him on the spot, until he's neatly saved by the arrival of the police. The only weakness to M lies in the ending, where a grieving mother reflects to the camera that the trial (and the death of the killer) will not bring back her child. Moralistically she admonishes the audience that only the increased vigilance of mothers everywhere is the answer. This 'blaming the victim' scenario doesn't work with sexual assault victims and neither does it work here. The film went to great lengths to demonstrate that the entire community must be alert at all times, and so the weak ending only serves to absolve the legal and medical system of any responsibility. A stronger ending where the mothers condemn society for turning a lazy eye to crime and treating the psycho/sociopath as a victim was just begging to be included. 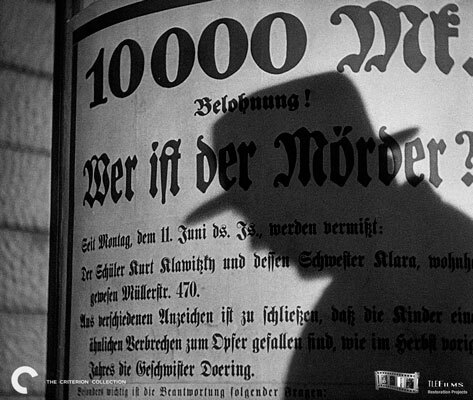 Ah well, a Fritz Lang I'm not! 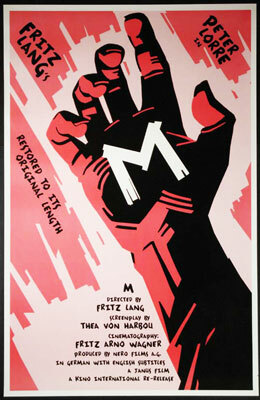 TCM's broadcast of M over its Noir Summer marathon featured a superb print of this film. I was struck by the exquisite tonal quality, which makes it look as though it were shot today, and not over 84 years ago.